However you wish to slice and dice the numbers, always remember to measure against the business KPIs or sales forecast plan. Most top retailers use WSSI (Weekly Sales, Stock and Intake), a merchandising tool that uses historical data to plan and monitor sales, stock and intake. The tool is especially helpful for inventory management, effectively maximising sales and keeping costs to a minimum. Of course, it doesn’t have to be done weekly, as some corporations review on a monthly basis. Regardless, the key is to track sales, stock and intake continuously so that you can realign and recalibrate if needed. For example, if you have a high intake, but low sales – that means you potentially have an overstocking issue (high stock). By following up consistently, you’ll be able to put an action plan immediately – you can either launch a marketing campaign or identify new sales channels to boost sales. To illustrate, we’ll be focusing on just one case study – core range sell-through by item, so that you have a clearer understanding. A core range consists of the basic essentials – the plain white t-shirts, black skinny jeans or light cardigans. In retail, a core range is usually the highest volume driver, as it generally does not need much marketing efforts to drive a high sell-through rate. Then, you benchmark the above against forecasted sales. Did it meet your intended sales forecasting number? From there, you can then look at the other factors. On the surface, it is a good sign – you’ve hit the goal for your core range! With that said, a brand can meet its sales goals, but still, have overflowing stocks in the warehouse. Therefore, it’s still vital to look at intake and inventory. Do you still have a lot of existing stocks left to clear? On the flip side, if you don’t have much inventory left, will there be incoming intakes to fulfil demand? Seen in the table, actual sales over-achieved forecast by 4%, leading to stocks cover at 3 months – which is turning faster than the intended 4 months (forecast 120 over opening 500), driven greatly by White colour option. Is the next intake on White sufficient to sustain sales momentum? Is there a need to increase replenishment order? What about the performance of other colours? If White colour sales slowed, will consumers divert to purchasing Black or Blue? This is a worrying sign, as a core range typically does well on its own. If you’re facing this issue, the first thing to do is to delay or cancel your intake – and then re-look into your inventory. Do you need to run a promotion strategy? Or do you have to re-evaluate your core range? Some brands categorise cold shoulder tops as a core, but certain demographics may not view that as typical everyday wear. Seen in the table, actual sales fell behind forecast by 17%, although stock cover ended at 4 months which met intended forecast. Looking closer at the performance of each option, White colour missed forecast greatly and contributed to higher stock cover at 5 months. Judging from the slow sell-through on White, should we cancel the next intake on White if possible without incurring penalty cost? Otherwise, what can we do to promote the sell-through on White? Is this a slow performing month for other retailers as well? Should we monitor for another month before taking action? Once you have a clear view of your sales, intake and inventory – you can then move on to the next step. It’s important to compare your data against external data too, so you can fill in potential missing opportunities in your assortment. Yes, even if you have healthy sales, inventory and intake positions, this step is still highly recommended. The practice is similar to competitive benchmarking (from Course 2 on Merchandising). You look at your competitors’ bestselling assortment or lookout for any trends that may emerge. For example, your core range may include just t-shirts and buttoned-up shirts. 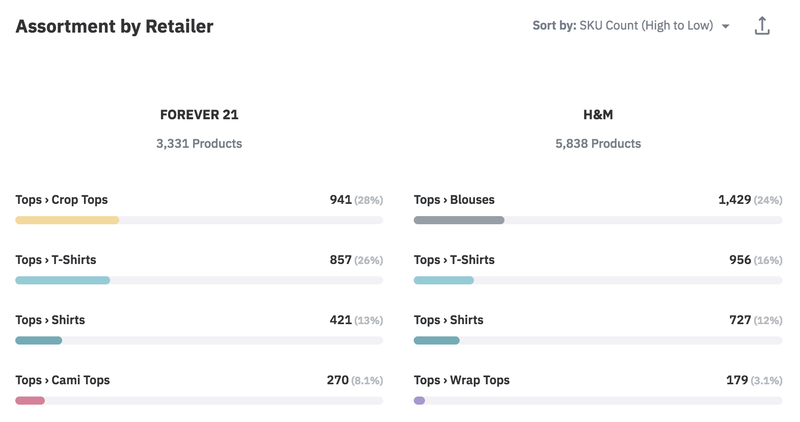 But after researching, you found out that crop tops and blouses are popular amongst your competitors’ assortments (via Omnilytics Competitive Benchmarking). With this information, you can then decide to either extend your tops range with crop tops and blouses or bring in similar styles. However, do take note that the opportunity to meet consumer demands need to be weighed and justified against cost and sales potential. Trying to jump on the athleisure trend, as an example, by releasing a full-fledged collection may not be wise. Instead, opt to raise intake for clothing with athleisure styles or trial with a small range of 3-4 styles with minimal depth. Lastly, you need to inform your key stakeholders, such as the management, of any updates. This is so that they’re kept in the loop of the brand’s current direction. There may also be cases where you may need extra funding for your marketing budget, or perhaps you need approval for an upcoming strategy – these can be brought up during the weekly or monthly meeting. For smaller companies, where there may not be a manager, the information can then be relayed to the CEO instead.